Welcome to 2014. It's a new year, and it's full of exciting new gaming possibilities. At this time it's also important to reflect back on the top gaming moments of 2013. The titles that represent the very best effort made by legions of talented individuals, solely designed to provide players with the maximum amount of entertainment. This year, we conducted an extensive preliminary round in which you shared with us your favourite games of 2013. 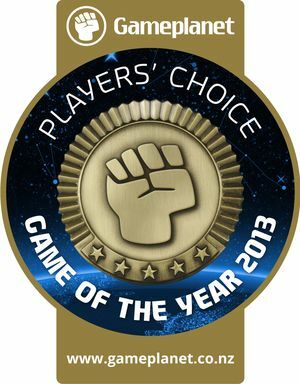 The top five nominees for 2013, as selected by New Zealand's gaming community and listed here in alphabetical order, were: Assassin's Creed IV: Black Flag, BioShock Infinite, Grand Theft Auto V, The Last of Us, and Tomb Raider. Next, we invited you to vote for these games to determine an overall Game of the Year. To sweeten the deal, we offered you the chance to win an Xbox One. Today, we reveal both the winner of the Xbox One, and the Gameplanet community's Game of the Year. We said: 8.5/10 "Lara’s origin story is an exhilarating ride full of great animations, amazing sound design, thrilling set pieces, and big action moments. There is enough variety and spectacle within to not only hook players but entrance onlookers as well. Lara’s growth into an apex predator is sudden, but it does precede a game full of 'Hell yeah' moments and enjoyably empowering game design. We said: 9/10 "Ubisoft has expertly distilled and fulfilled in Assassin’s Creed IV: Black Flag a swashbuckling open-world adventure set in the sun drenched Caribbean at the apex of piracy’s golden age. We said: 9.5/10 "Almost all characters have hints of depth and believable development arcs, the voice-acting is world class, and the cutscenes are fantastically directed and animated. The combat systems provide great possibilities for emergent gameplay, and it’s not often any particular action is forced upon the player. Everything just slots together seamlessly. We said: 10/10 "Rockstar’s marquee franchise built its reputation on holding up a coke-dusted, blood-caked mirror to American culture, and American culture has never been so hysterical, so vain and insipid, so schizophrenic, and so indentured." "That’s a boon to Grand Theft Auto, a comedy noir series that indulgently peddles a fantasy as old as America itself. From Bonnie and Clyde to Bodhi and the ex-Presidents, the outlaw has near-mythical status in the Western psyche as the ultimate expression of personal freedom and self determinism. Today we add Trevor, Franklin, and Michael to our rogues gallery of antiheroes and sympathetic sociopaths." Our very warmest congratulations to everyone at Rockstar Games from the team at Gameplanet. Congratulations also to Oliver Grainger who is the winner of our Players' Choice voting competition and has scored himself a brand new Xbox One!